London. GeWeTe – the cash-handling expert of the Gauselmann Group – reports of its most successful ICE ever. 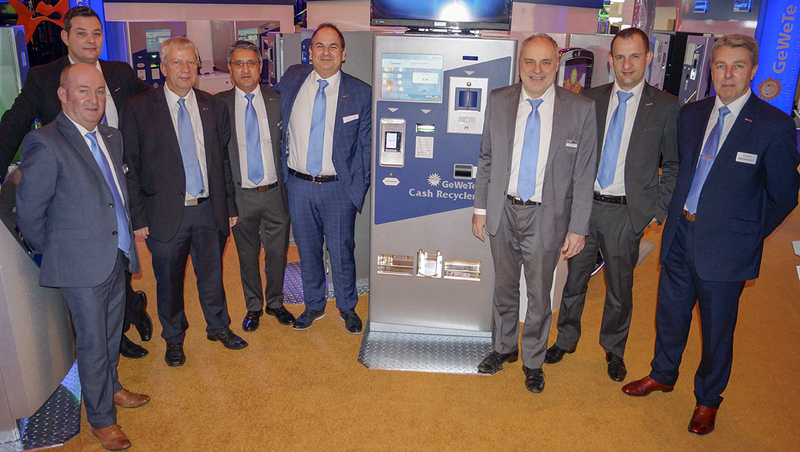 It is only three years since GeWeTe assumed the responsibility for redemption machines to the casino market within the Gauselmann Group. GeWeTe brought long-standing success here from the AWP, AGC and amusement market where it has been extremely successful for almost 25 years now. GeWeTe has made a very strong impact into the casino market. Already today GeWeTe solutions can be found in well over one hundred casinos. Based in Germany, GeWeTe has 100% control over the entire R&D, production and sales and service processes. This enables the team to react quickly to create exactly what their customers need. This explains why GeWeTe has such a strong product range – it offers the right product for every application. These ‘made-in-Germany’ change and redemption machines have proven themselves time and time again. Gaming operators will be pleased to know that the GeWeTe solutions can be connected to all the well-known casino management systems – ensuring simple integration. “At the end of the day, I strongly believe that our solutions offer the best value for money in the entire market. Our products are extremely secure and include only the best components. That means that our machine uptime is extremely high. Operators rely on their change/redemption machines and there is nothing worse than if it does not work. Our machines keep on working – they stand the test of time. We are always there for our customers. We have continually expanded our teams in England, Italy and Spain as we believe in helping our customers in their own language in their own country as much as possible”, explained Mr. Aristidis Tsikouras, Managing Director of GeWeTe. The best-selling GeWeTe solutions include the Cash-Center-Compact, especially the Cash-Center-Compact-Casino and the Cash Recycler range. Today GeWeTe solutions can be found in casinos, Adult Gaming Centres (AGCs), arcades, VLT locations, bingo halls, sports betting locations and Family Entertainment Centres (FECs) – thus in all gaming and amusement segments.